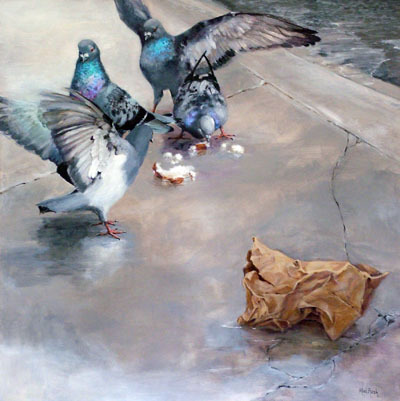 Mae Rash, with a background in abstract fine art, specializes in paintings of wildlife in action---particularly birds. 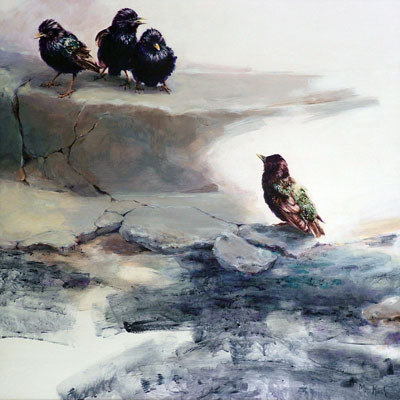 Her brushwork is characterized by both spontaneous splash and intricate detail which are integrated into unified works containing both abstract and realistic elements. 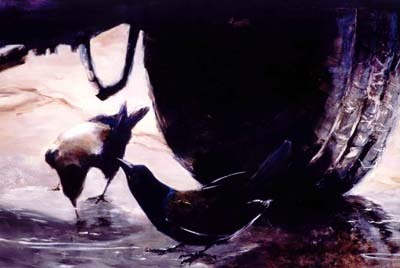 Her paintings have appeared on national tours of the Leigh Yawkey Woodson Art Museum "Birds In Art" exhibitions, as well as national tours of the Society of Animal Artists' "Art and the Animal" exhibitions, from which she has received the coveted Award of Excellence and the Patricia Allen Bott Award for Creative Excellence. 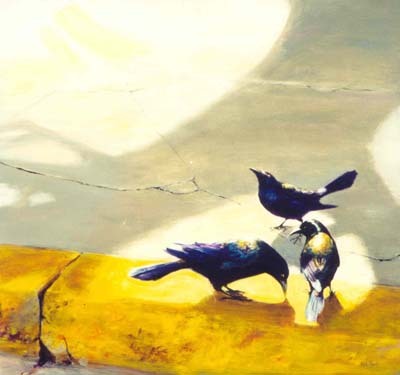 Mae's "Street Birds™" (right), a continuing series of paintings of common birds in city environments, have appeared in International Artists Magazine (Oct.-Nov. 2001), and in Best of Wildlife Art 2 by Rachel Rubin Wolf and The Artist's Illustrated Encyclopedia by Phil Metzger, both published by North Light Books.